That last screenshot, while delivering more colour as promised, didn’t really show anything that people hadn’t already seen many times before. So to make amends, I’m adding one more screenshot tonight. 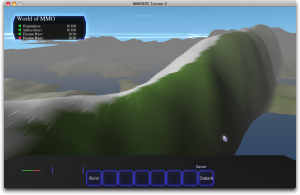 I’m now partway through adding region-terrain-styling support. In this image, we’re peeking over the region boundary between a green, grassy region, into a more snowy, rocky region. This is still very early, but I think it’s nice to start seeing some more variation in what the terrain looks like! 11 October, 2009 in VectorStorm.